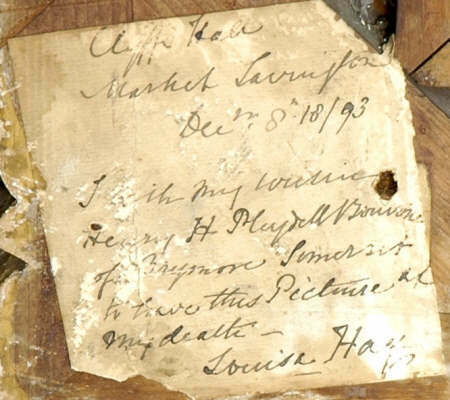 Market Lavington Museum curator was contacted by The Neale auction house in New Orleans about an oil painting they had for sale. 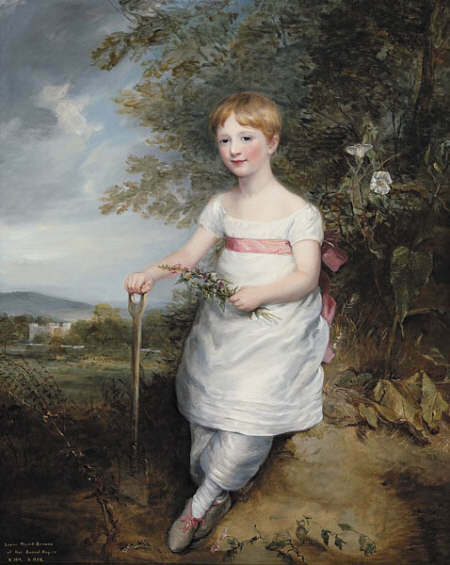 The picture was of Louisa Hay, as a child, at her grandfather’s home near Salisbury. For the help given to them, the auction house gave the museum a photographic copy of the oil painting. The oil painting has a later caption added on it. Louisa was born a Pleydell Bouverie and her family held the lordship of Market Lavington during the nineteenth century. Her Grandfather was Lord Radnor. Louisa married Samuel Hay in 1832. The marriage lasted but fifteen years for Samuel died in 1847. By 1851 Louisa was living at Clyffe Hall in Market Lavington. This was a Pleydell Bouverie property at the time. Louisa lived there, as a widow, until she died in 1898, aged 87 years. The painting had a clue to its identity on it, and the auction house was kind enough to copy this for the museum. It was this data that led them to the museum in their quest for information. The entry in the Neale House Auction Brochure is shown below. Note: This captivating and very noble sitter was the granddaughter of Jacob, Baron Pleydell-Bouverie, 2nd Earl of Radnor (1750-1828), as well as daughter of the latter’s younger son Admiral Duncombe Pleydell-Bouverie, and his wife Louisa May; her cousin Jane became one of Queen Victoria’s bridesmaids. A dozen years after this splendid portrait was painted, the sitter married the equally eminent Hon. Samuel Carr Hay, son of William Carr Hay, 17th Earl of Errol (1772-1819), and the latter’s second wife Alicia, daughter of Samuel Elliot, Esq., of Antigua. Young Samuel (at about the time of this portrait) had entered the Naval profession of his uncle, the Hon. James Carr Hay, R.N., who had drowned while on active duty in 1792 (Samuel’s own eldest brother James, Lord Hay, having himself been killed at the Battle of Waterloo, in 1815). In 1820 Samuel’s second brother, William George (by then 18th Earl of Errol) married one of the natural daughters of King William IV, Elizabeth Fitzclarence. It might possibly have been through such exalted connections with the royal family (since the sitter’s father, the admiral, would probably have known his future son-in law from Samuel’s first days in the Navy) which may have inspired this metropolitan portrait, a work very likely to have been commissioned by Louisa’s grandparents, the Earl and Countess of Radnor, as witnessed by the beautiful landscape view of their ancient seat, Longford Castle, appearing in this portrait’s background, as an understated reminder of the antiquity and illustriousness of Louisa’s lineage. Even without the faint “B” partially visible on the bottom right edge of the image, or the “B, W” inscribed on the reverse of the lower stretcher bar, this painting is clearly a characteristic and representative work by the court painter to King George IV, Sir William Beechey (who appears rarely, as a rule, to have signed even his most important canvases). Its nearly exact counterpart, and earlier prototype, is Beechey’s very similar portrait of “Master William Gosling Playing A Drum”, that the artist presented as no. 536 in the Royal Academy exhibition of 1800 (and which was held until recently in the collection of the artist Carl Marr at the West Bend Art Museum, West Bend, WI). This entry was posted on February 26, 2010 at 9:50 am and is filed under Museum. You can follow any responses to this entry through the RSS 2.0 feed. You can leave a response, or trackback from your own site. I was delighted to see the reproduction of the beautiful painting of Louisa Hay (nee Pleydell Bouverie) as she is a distant relative. I descend through Ann Coppendale my 6xgt grandmother who married Thomas Oliver in 1670. Ann’s brother Samuel was Louisa’s gt gt grandfather. His granddaughter was Mary Coppendale, (later May) Louisa’s grandmother. The Coppendales were a well-known East and West Yorkshire family all connected together and descending from the first Coppendale, John Thornton who took the name Coppendale in the 14th century. They were originally wool merchants in Beverley East Yorkshire. Lovely to hear from you. I’m sorry we don’t have the original, of course. I’m also a Coppendale and very interested in your claim that Mary May (nee Coppendale) was the great granddaughter of Samuel Coppendale. I have so far only traced her father and grandfather (both John) but if her great grandfather was Samuel, could this be the same Samuel Coppendale who married Elizabeth Moore in 1665 and was at the top of a branch of the family who were influential in Wakefield in the early 18th century, including their son William who was a tobacconist and a Governor of Wakefield School? I’d be interested in any more information you have. person mentioned in this item. regards. Hope this helps clarify who was who!!! We are always delighted if errors of fact are pointed out. One of the objects of a blog like this is to get contact from people who really know. We rely mostly on what we can find on the internet. We have been guilty of that common error of believing what we find on it.